Wagtail Cottage01263 715779work01603 870304fax Self-cateringWagtail cottage is traditional style cottage some areas dating back to the 15oos. The property has been sympathetically renovated to boutique style comfortable accommodation, with a delightful garden leading down to the river.Stiffkey is in a superb area of outstanding natural beauty, with Blakeney, Wells-next-the-Sea and Holkham within a few miles, offering excellent opportunities for ornithology, walking, and beautiful sandy beaches. • Outdoors: Fully enclosed garden, lawn, patio, pergola, summerhouse, barbecue, table and chairs. • Notes: Due to the river at the bottom of the garden, children should be supervised at all times. Short breaks are welcome at the property, however the owner cannot accommodate 2 nights. 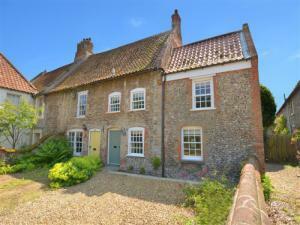 This brick and flint cottage has been beautifully restored and renovated to a very high standard. Wagtail cottage is traditional style cottage some areas dating back to the 15oos. The property has been sympathetically renovated to boutique style comfortable accommodation, with a delightful garden leading down to the river.Stiffkey is in a superb area of outstanding natural beauty, with Blakeney, Wells-next-the-Sea and Holkham within a few miles, offering excellent opportunities for ornithology, walking, and beautiful sandy beaches.